UT uses a lightning prediction system on campus to help alert the campus community about approaching weather and lightning, called Thor Guard. When a storm approaches the campus within a two-mile radius, the alarms will begin to signal, typically eight to 20 minutes prior to a lightning strike. 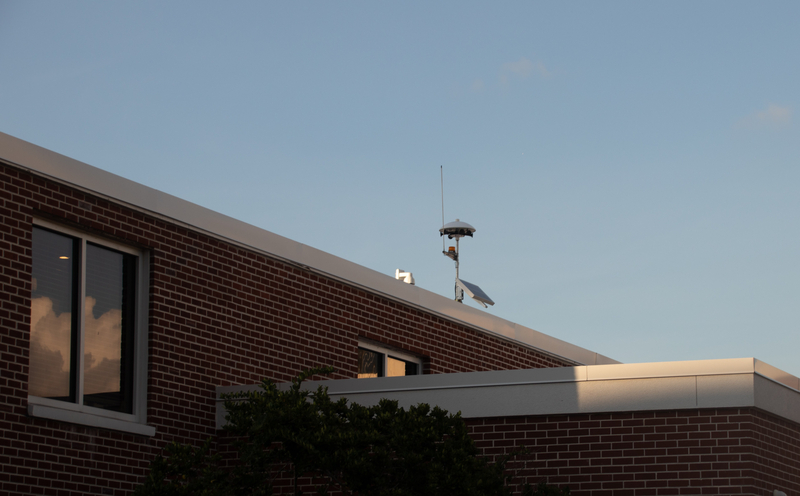 These Thor guard systems are located on the rooftops of Macdonald-Kelce Library, McKay Hall and R.K. Bailey Arts Studio. If you are puzzled as to why there is a blaring siren that goes off almost every other day as you walk on campus, don’t be alarmed. The noise may tend to startle students, but this is really just a warning system that is meant to keep students, faculty and families safe. Just like the god of thunder himself, Thor Guard will warn and alert students and staff about potentially dangerous lightning in the area. The system receives a signal from a notification center to alarm the public when a storm approaches. Thor Guard will then set off a 15 second warning blast and illuminate strobe lights on the units. Once the lightning threat passes, three five-second horn blasts will indicate an “all clear,” and the strobe lights will turn off. “I thought I heard a train coming, but then I realized that couldn’t be right,” Christina Pastore, a freshman business finance major said. She said that while her professor later filled her in on the use of the Thor guard, and how it is meant to protect the campus, she was very scared when she first heard it. The dangers of a thunderstorm threaten UT consistently, especially in the spring and summer months. According to the National Severe Storms Laboratory, flash flooding, lightning and high winds are potentially life threatening effects to a severe thunderstorm. Cat Sterlacci, a swimmer on the UT team, describes a time where Thor guard protected her team when an unexpected storm came through Tampa. The Florida Department of Agriculture and Consumer Services lays out safety tips when a storm approaches. It recommends taking shelter immediately, avoiding usage of a shower or bathtub and to stay away from wire fences, telephone polls and conductive elevated objects. According to the FDACS, lightning is unpredictable and can strike up to 25 miles away from its storm of origin. Safety is a top priority at UT, and any precautions students and staff can take to ensure protection from a storm is highly encouraged. The installation of the Thor Guard L75 was funded by UT’s Student Government Association in 2010 and was passed due to the tropical climate the public experiences in Tampa. When the alarms sound all UT related outdoor activity are to be discontinued and all individuals on the UT campus are advised to seek shelter. Although, when the alarm activates it does not interfere with class schedules, and shouldn’t cancel or postpone scheduled indoor events.